Accommodation comprises eight tents for a maximum of 16 guests, each with en-suite bathroom facilities and a private viewing platform looking out on the lagoon. Lodge facilities include a dining room, pub, lounge area, wildlife library and a swimming pool. 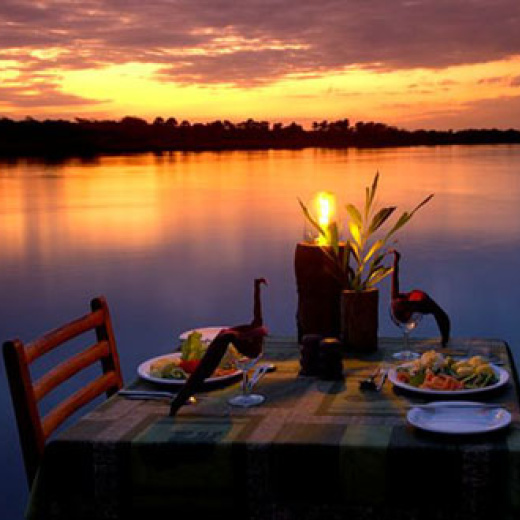 Mvuu Lodge nestles discreetly on the banks of a lagoon just off the Shire River on the western boundary of the wildlife-rich Liwonde National Park. The main lounge building is set high above the water for long views up-river. The Lodge is small and intimate in a stunning and secluded setting. A raised thatched dining area overlooks the lagoon and the nearby swimming pool is made of natural rock. Boat trips are the highlight and offer the best way to seeing the park’s elephants as well as the huge crocodiles and the night birds. Walks with qualified scouts are also offered. The wildlife includes large breeding herds of elephant, plenty of hippo and crocodile, sable antelope, impala, reedbuck, oribi, leopard, serval and lion. Birdlife is prolific with the park regarded as one of the finest birding spots in Africa - both for the number of species and the relative ease with which the ‘specials’ can be seen.